Available as low as $6.29 per coin over spot! 2017 is the Year of the Rooster on the Chinese Lunar Calendar, the Perth Mint is celebrating with the release of the 10th coin design in its ever-popular Lunar Series II program. With one coin for each of the 12 animals in the Zodiac, Lunar Series II coins are popular additions to any collection. Right now, the 2017 1/2 oz Silver Australian Rooster Coin is available in BU condition on Silver.com. Arrives in a protective plastic capsule. Lots of 100 ship in mint boxes. 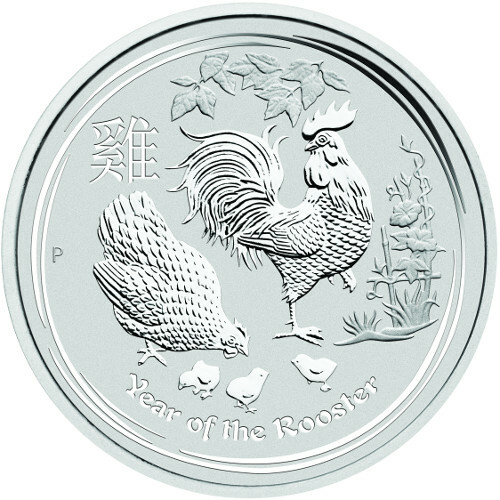 Reverse includes the Year of the Rooster design. The Lunar Series II coin program from Perth Mint started in 2008 with the release of its Year of the Rat coin. The 12-year cycle of the Zodiac will be strictly followed throughout the series, with the Perth Mint releasing new coins each year to honor the animal represented on the Chinese Lunar Calendar. 2017 marks the Year of the Rooster, and those born under its sign are said to be loyal, hardworking, honest, and sociable. The Year of the Rooster issue from Perth Mint includes a gold and silver version of the coin, with both available as bullion and proof specimens. 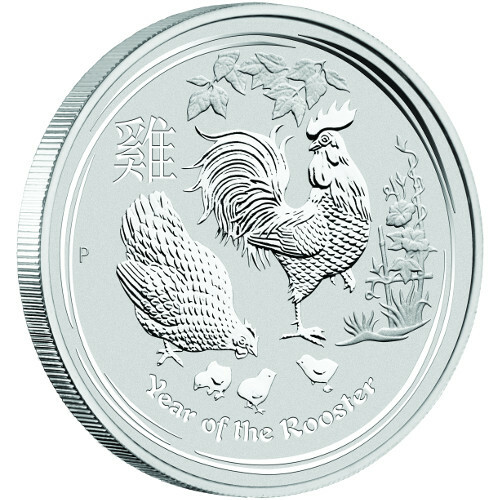 The 2017 Silver Australian Rooster features weights of 1/2 oz, 1 oz, 2 oz, 5 oz, 10 oz, and 1 Kilogram. Each 2017 1/2 oz Silver Australian Rooster available here is a BU specimen. Coins in Brilliant Uncirculated condition exhibit no signs of wear and tear. With that said, minor flaws do exist and range from breaks in the luster or spotted surfaces to contact marks from the coining process. 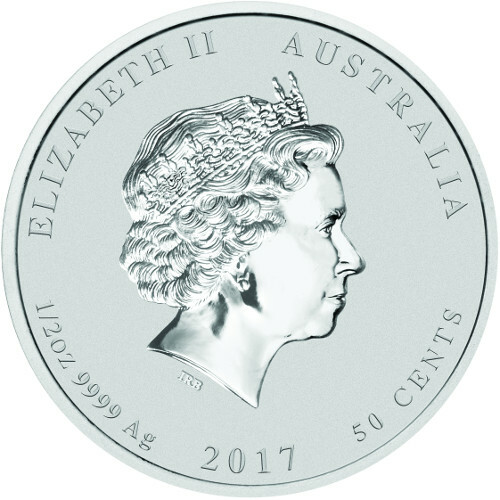 On the obverse side of all 2017 Silver Australian Rooster Coins is the image of Queen Elizabeth II. Created in 1998 by Ian Rank-Broadley, this is the fourth-generation image of Her Majesty on commonwealth coinage. Though a new portrait of the Queen is available, Perth Mint is continuing with this design to lend continuity to its Lunar Series II program. 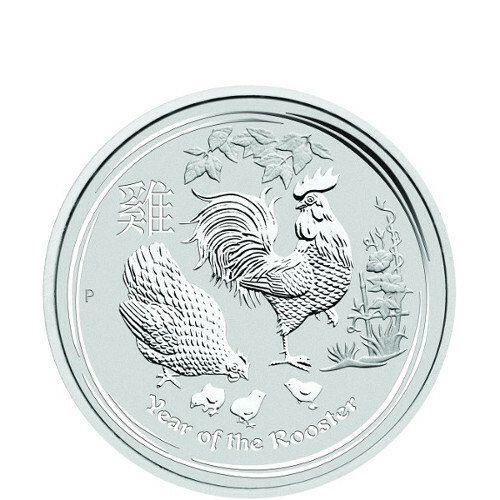 The reverse of each 2017 1/2 oz Silver Australian Rooster coin includes the Year of the Rooster image. This design features a male rooster, one hen, and three chicks amongst the bamboo foliage and flowers. Engravings include “Year of the Rooster,” “P,” and the Chinese symbol for rooster. Perth Mint is Australia’s oldest operating facility. Located in Perth, Western Australia, it is a state-owned entity of the government and operates outside the Royal Australian Mint in Canberra, which is the sovereign mint of the nation. If you have any questions, please don’t hesitate to ask. You can contact a Silver.com customer service team member at 888-989-7223, reach out to us online using our live chat, or email us directly.